Although accounting for just 10% of total champagne production, vintage champagne is a topic of much discussion for both those in the industry and the avid consumer. Which vintages are the best, how their characteristics differ and their potential for ageing are just a few of the subjects often debated. To demonstrate just one of these subject matters – how well vintage champagne can age – we asked Essi Avellan MW to present an Evolution of Champagne Masterclass at our quarterly Champagne Range Tasting at Frederick’s Restaurant last week. To accomplish the task, we assembled five pairs of vintage champagne, one old and one new, from five leading champagne houses. We tasted the champagnes sighted and by brand. Scores displayed below are group averages. 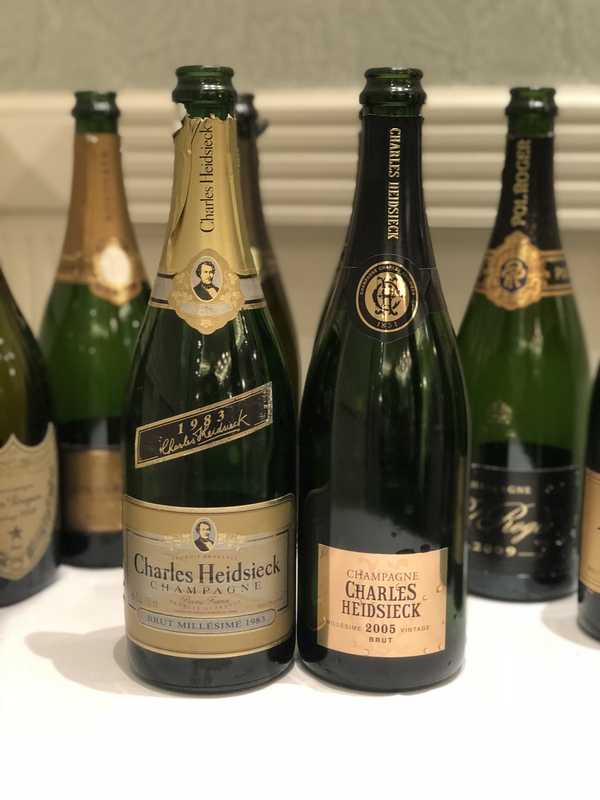 The Charles Heidsieck pair included the oldest champagne of the evening – Brut Millésime 1983 – and therefore displayed the greatest age disparity: 22 years. Essi was quick to highlight the importance of establishing provenance when purchasing older vintages of champagne, which, susceptible to damage resulting from fluctuations in temperature and light, must be stored with extreme care. Under correct conditions, champagne can be stored for decades and continue to age magnificently, developing newfound levels of complexity and intrigue. There is perhaps no better example of this than Brut Millésime 1983. Released just last year as part of the Collection Crayères, it has spent the majority of its existence stored in perfect conditions in Charles Heidsieck’s chalk cellars in Reims. The result is something to behold. With surprisingly racy youthfulness, it is a timeless champagne, showing all the colour and maturity of its age, but the lively effervescence of a champagne much younger. Everyone’s clear favourite on the night. Brut Millésime 2005 (which, by the house’s own admission should have been held back and launched after the newly released Brut Millésime 2006) is only just starting to open up, getting more expressive with age. 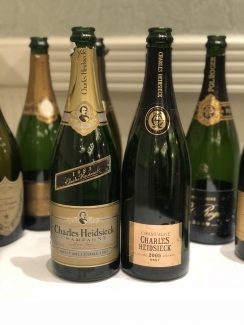 No doubt the slightly higher dosage that Charles Heidsieck give their champagnes also improves their ability to age well. Already displaying quite linear improvement and with a dosage of 10.8 g/l, Brut Millésime 2005 is sure to keep for many more years, if stored under the correct conditions. Great colour, golden and green tinged; has a wonderfully full nose, the creamy toasted notes, lots of ripe dried fruits and nuts and wow on the palate all comes through with layer up on layer building on your palate and it is still fresh with a nice hint of saline on the finish. Big mouth-feel and loads of fruit with lots of phenolic character. This really started to open up a year ago and is getting more expressive with age. With the Dom Pérignon pair, Essi shared invaluable insight into the specific vinous qualities that affect champagne’s ability to age – our understanding of which have changed over time, as both winemaking technology and knowledge of the ageing process have improved. When Dom Pérignon 1996 was produced, it was believed that acidity was the key to ageing. This has since been shown to be a misconception, and phenolic compounds are now considered the key factor in determining champagne’s ability to age. Will 2012 replace 2002 as the best vintage of this century so far? The highly acidic year of 1996 was therefore initially considered one of the greatest champagne vintages ever. 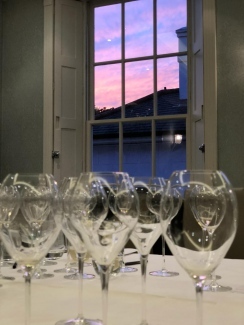 However, many winemakers now look back at an opportunity missed – the grapes in 1996 were picked very early, when acidity levels had reached the desired level, but before the grapes had developed enough ripeness. 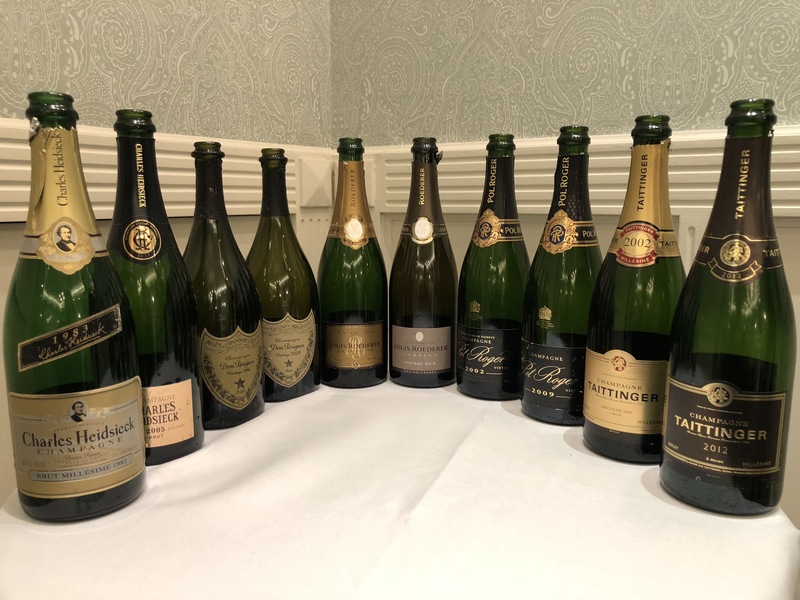 Without pushing for full ripeness, there was a lower phenolic content in the grapes and some champagnes from 1996 are now beginning to show their age. 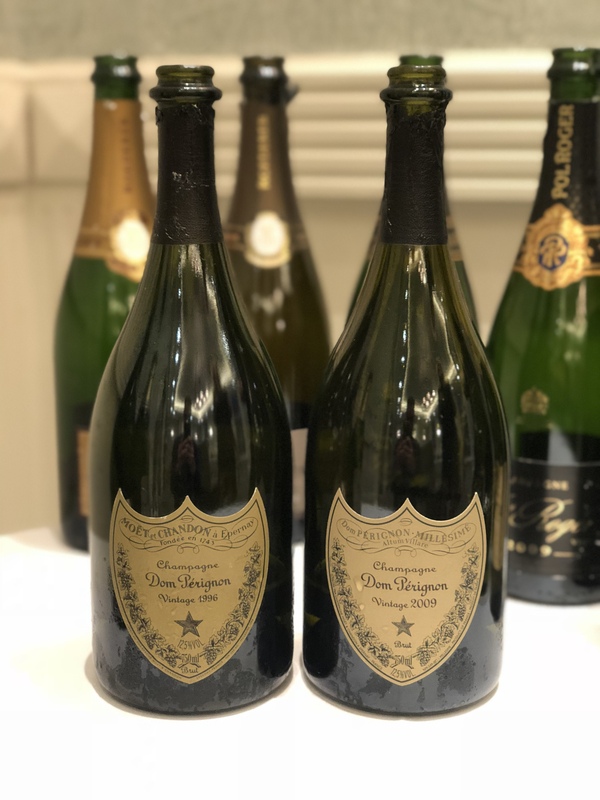 Although 1996 may not be the legendary vintage many first thought, the longer lees ageing of Dom Pérignon 1996 (particularly the Plénitude 2 creation Dom Pérignon Oenothèque 1996) has helped balance the lack of ripeness. It is still a champagne that divides opinion but showed delightfully at this tasting. Tight on the nose. Loads of acidity and incredible mid-palate with fresh tropical fruits in abundance and packed full of freshness. Ageing very well and the bracing acidity that is the hallmark of 1996 is not dominating. Hint of smokiness as always, with lots of red apple and pear flavours. Then on the palate more summer fruits; melon, sherbet, lemon and lime. Enough acidity to keep it very refreshing and light; would benefit from more ageing. 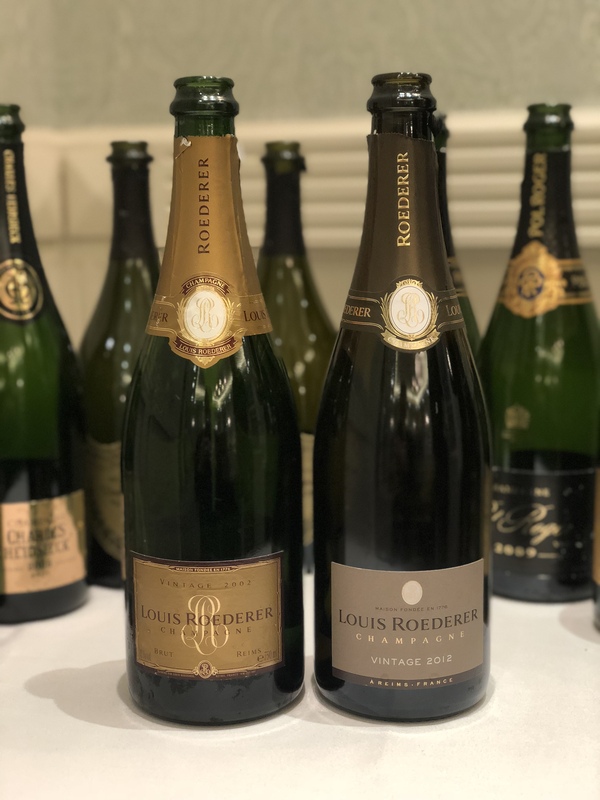 The focus for the Louis Roederer pair was on vintage comparison. The spectacular vintages of 2002 and 2012 were very similar in terms of quality, but vastly different in terms of quantity. Where 2002 took place under near perfect growing conditions and ended with an abundant harvest of high-quality grapes, 2012 was blighted by hail and frost in the early season and culminated in a small harvest of exemplary grapes. Brut Vintage 2002 has performed well in past tastings and was on great form last week. Essi noted how some champagnes from 2002 have begun to show over-ripeness as they age, with botrytis-like aromas creeping in. There was certainly none of that here; just fresh, bright acidity and lots of richness. 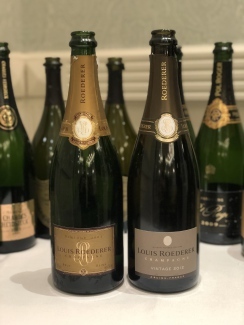 The next standout vintage in champagne (to follow 2002 and 2008) is undeniably 2012, and Roederer’s Brut Vintage 2012 was one of the first to hit the market. Although still incredibly young and therefore no match for the now sixteen-year-old 2002, the potential for 2012 is limitless. If you haven’t tried it from magnum, do it. Do it now. Initial meaty character with a real creaminess and a hint of mushroom. Bright acidity showing with multiple fruit layers and richness. A touch of iodine and lots of development. Superb! Big, broad fruit character and lovely mouth-feel. Rich with hints of smoke and concentration. Good length. Although the Pol Roger champagnes weren’t at their best last week (hence the unexpectedly low scores), the differences in maturity were stark. With vastly different post-disgorgement ageing periods (11 years for 2002 vs 11 months for 2009), the 2009 really is still a baby. Brut Vintage 2002 is starting to show loads of development but still retains the youthfulness characteristic of the vintage. The current vintage, Brut Vintage 2009, was released earlier this year. 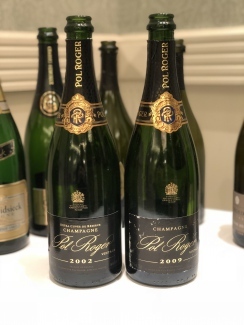 Similar in style to Pol Roger 2004, it is delicate and round, with an abundance of rich and ripe fruit flavours. Given time, it is certain to age gracefully. Lots of rich, ripe lemon and juicy apple notes. Delicate pear on the nose and some of that chalkiness and grapefruit texture. Seems to have a hint of sweetness that makes the acidity seem light, but its quite fresh. Going back, you get more peaches and aromatics, like white blossoms and some banana character. 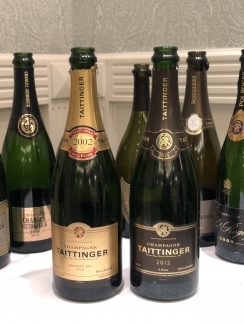 As with Louis Roederer 2002, Taittinger Brut Vintage 2002 has performed exceedingly well in past tastings. 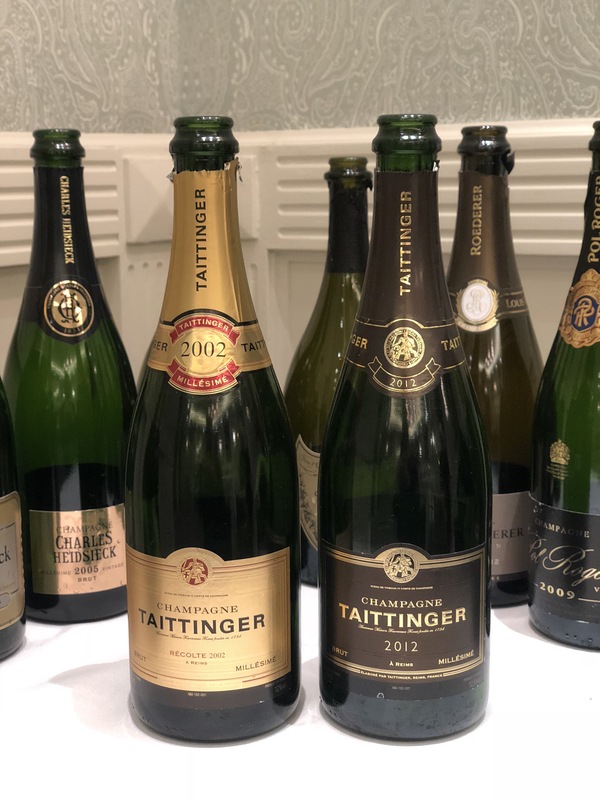 The inimitable reductive, Chardonnay-dominant style of Taittinger was showcased without flaw in this champagne last week. What’s more, its youthful vinosity shows no sign of decelerating into maturity – this will age superbly for many more years to come. The newly released Brut Vintage 2012 was one of the best of the current vintages, although its youth possibly led to it being a little under-rated on the evening. Another champagne that is impressive from bottle and simply stunning from magnum – one to watch for the future. Good concentration, fresh apples and pineapple come forward with a the charm of the yeasty bread character coming through and lovely fresh salty finish. Dosage seems noticeable.